The Small Cup Daffodils have less prominent trumpets and larger petals. The trumpet (cup or corona) is not more than one third in length than the perianth (petal) segments. One flower per stem. 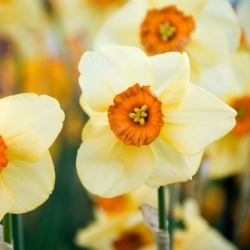 Altruist Daffodil is a small cupped narcissus with 3-4" peachy-yellow petals and a dark red crown. In a cooler part of the country the cup will be dark burgundy with strong copper colored petals and will prefer full sun. In warmer climates the petals will have a more lemony gold color and will prefer partial shade. The right growing conditions will help Altruist stay true to its color better. 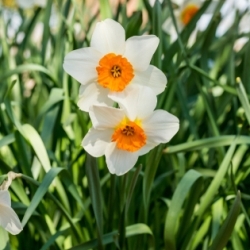 Barrett Browning Daffodil is a small cupped narcissus with white petals and an orange ruffled crown.